Last weekend, I had the great opportunity to participate in the Tour de Fat! 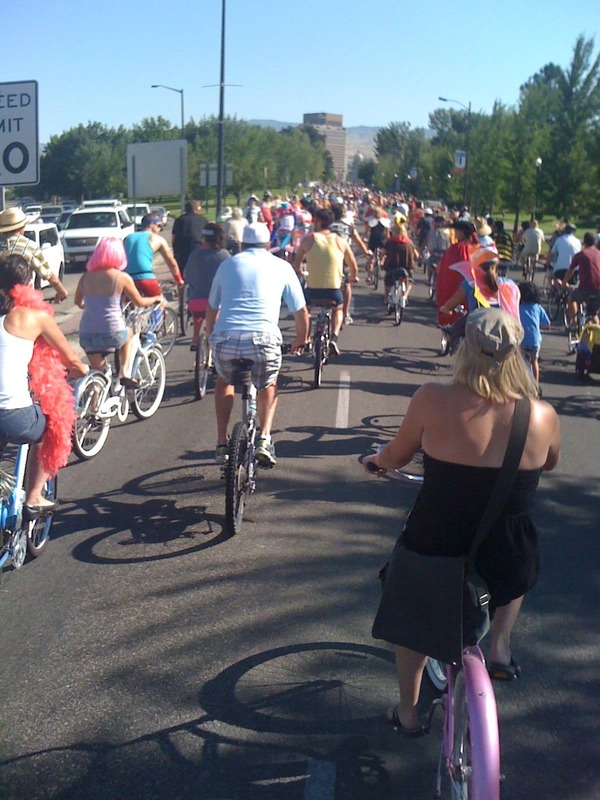 This event is basically a huge bicycle parade with people wearing funky costumes and decorated bikes, followed by a festival with music and food. 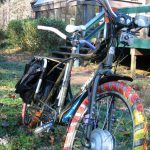 The Tour is sponsored by the New Belgium brewing company – a beer company who just happen to also be fans of bikes and sustainable transportation! I had not participated in this before, so we weren’t too sure what to expect other than “decorate your bikes”. 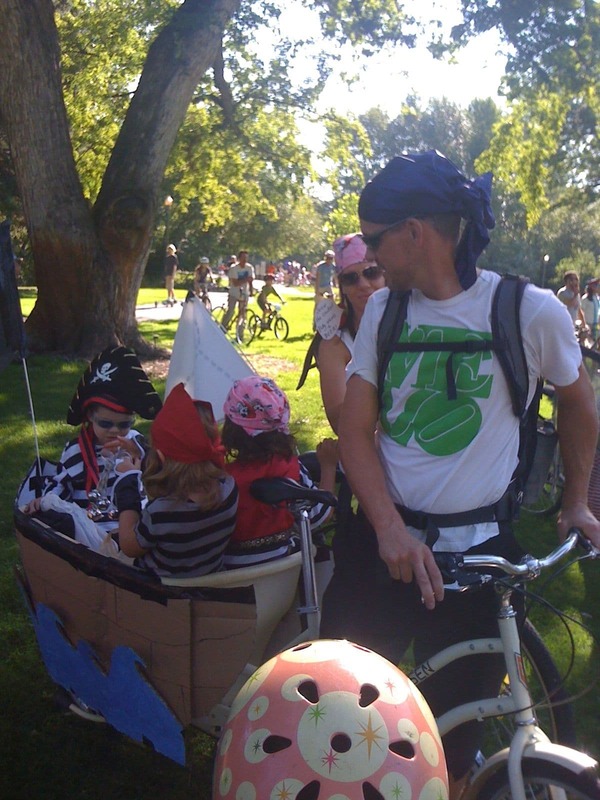 We decorated the Xtracycle and my daugther’s bike with colorful streamers and the kids dressed in costumes complete with tails sticking out behind. Then we headed down to Ann Morrison park where the parade was meeting. What we found was a huge number of bikers assembling to roving music. 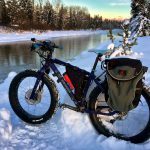 We met 3 other people with Madsen bikes (an estimated 50% of the Madsen owners in Boise), one of whom actually bought her electric assist kit from Cycle 9! After milling around for awhile, the parade started heading out and we joined the slow moving group. 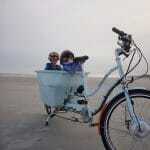 We were fortunate to be near one of the roving music trikes, and jammed out to tunes while riding with the crowd. The tour route took over one of the main arteries through downtown – a 4 lane, one-way road that crosses the river and approaches the capital building. People were ringing their bells, cheering and waving to waiting cars and generally having a good time. As we neared the capital and turned the corner and there were bikes as far as I could see in both directions, including the apx 1 mile behind me down Capital blvd. It reminded me of pictures of the Boston marathon or something. I heard later that an estimated 3,000 people participated in the parade – a new record. Of course, a main purpose to the tour is FUN. 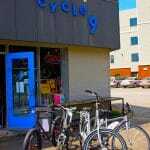 But the festival afterwards was also a fundraiser for local bike projects. 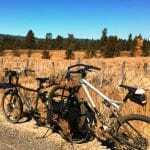 Sales of beer, food and festival booths raised over $43,000 for Southwest Idaho Mountain Biking Association, Treasure Valley Cycling Alliance and Boise Bike Project to put to good use in the community. Just goes to show what can happen when bikers get together! I’m glad I got a chance to participate in this really fun event, and I encourage you to do so if you’re in one of the Tour cities. Go out and meet your biking community!